Spring has arrived, meaning that it’s time to dust off your lawnmower and gardening tools to prepare for the season ahead. Garden lawns play an important part in our outdoor summer enjoyment – they host parties, provide a space to play, relax and read, and el fresco dining. Therefore, it is important to get the first mow of the year just right to set your lawn up for a summer of use. Here are some practical tips for that first cut. After months of bad weather and lack of sunshine, your lawn may look a bit sad. Time to clear any mess including dead sticks, leaves and any rubbish that may have gathered. Check to see what is hiding in the grass; stones and thick branches may have made their way into the overgrown lawn and the lawnmower blade can be damaged if the lawn mower catches these. Keeping the mower blade sharp is important as a blunt blade can cause damage to the new grass, opening up space for pests and diseases to enter. Although the difference in climate can vary depending on where you live in the country, usually the first two weeks in April is the best time to dig the lawnmower out and give the garden a good trim. When cutting your lawn for the first time, always follow the one third rule: never cut more than a third of the blade of grass in one go. The reason: cutting more than this can stress the grass. Gradually reduce the grass length over a number of weeks to reach the desired length. Cutting the grass too short, too quickly, can lead to disease and weed infestation. What if your grass is really long? If your lawn has been a little unkempt throughout the colder months and has grown longer than you would like, still follow the one third rule but take it in stages over a number of weeks. Gradually decrease the cutting height on your lawnmower each time until you reach your preferred grass length. The edges of your lawn are important too when cutting your lawn for the first time. Overgrown edges can look messy and can mean time and effort spent working in the garden has been in vain. Trim the edges straight after mowing. • Watering late in the evening or at night can lead to fungal problems as the grass doesn’t dry out as the sun has set. • The middle of the day is when the sun is at its hottest. This leads to the water evaporating instantly or the droplets acting as a magnifying glass, burning the blades of grass. • So the best time is first thing in the morning as the air is cool and the water can travel to the roots before drying up. If you have repaired your lawn in the autumn the new grass that has grown from the seed will be noticeably weaker than the rest of the lawn and can be easily damaged if cut incorrectly. Wait until the grass has grown over three inches in length before mowing for the first time to allow it time to build up strength. Following your first cut of the season, you should consider mowing your lawn once or twice a week to maintain the desired length. This is due to the warm weather encouraging your grass to grow. It’s important to remember that no two lawns or gardens are the same even if they are side by side. Take into consideration the condition and size of your lawn, and your gardening needs when choosing the best lawn mower for the job. With the growing season coming to a close, you should be looking forward to putting your lawnmower away for the winter. The best time to service your lawn mower is immediately after the last cut of the season. By doing this you will miss the mad rush next spring when everyone else has left it to the last moment to get their lawnmower or ride-on-tractor serviced. Also it is not good to put the mower away for the winter if it is wet and caked in grass clippings as it will cause it to rust and deteriorate. At WG Gardencare Machinery Ltd we specialise in servicing and repairing all types of professional and domestic garden machinery including mowers, four and two stroke machines and commercial diesel tractors. When we service a lawnmower, ride-on-mower or tractor we will look at a whole host of things. For a full list of what is included in our winter service click here. We will collect your mower and return it to you at home once the service is complete. Our Collection and Delivery Service covers West Sussex and Surrey. So once spring arrives you will be ready to go with only a few spot checks needed. Once any faults have been repaired as part of the annual service, all you’ll need to do before use is check the oil level using the dipstick and top up if needed. After use, clean the underside of the mower with a damp cloth to prevent a build-up of grass and rusting. Be sure to tip the mower toward the back of the sump, rather than toward the carburettor. Consult the manual if you’re not sure. If you’re storing more than one can, you can prolong the life of fresh fuel by adding an ‘additive’ or ‘conditioner’. Our comprehensive workshop facilities offer a service – second to none. Our service price is carried out at an hourly rate with free estimates. Please call us on 01403 700743 or email us for a quote. And from the 1st November 2017 until the 1st April 2018 we are giving 10% off our winter service. 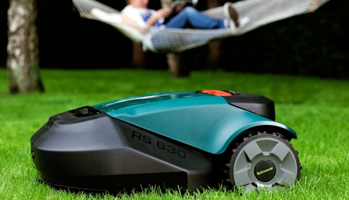 Robot lawnmowers – To buy or not to buy? If you feel that cutting the grass twice weekly at this time of year is important then there are two ways of looking at this job, a chore that has to be done or a way of getting some useful exercise before the BBQ! Whichever way you look at it there is now the opportunity to buy the latest tech to cut the grass so you don’t have to lift a finger. Your robot lawnmower can cope with any shaped garden including slopes and garden furniture such as tables, chairs and even trampolines. The environmental benefit is that all robot mowers mulch the grass they cut, shredding it finely and scattering the cuttings back onto the lawn to feed the soil with nutrients and protect the grass from drought. If you are considering buying a robotic mower, make sure it’s suitable for the size and shape of your garden as the more expensive ones are really only worth it if you have a big plot. Check how long the battery lasts on a full charge and how long it takes to charge up as you will find that some take under an hour to charge whilst others take up to 16 hours. Do you want it to cope with wet grass? Do you want it to be quiet? How long does the battery need to last to do the whole lawn/lawns? Below we have listed 8 robot lawn mowers that are currently on the market that you may want to consider. If you have any questions, require help choosing a robot lawnmower then please contact Jeremy or Graham on 01403 700743 or email us and we will be happy to help. Our Winter Service Supersaver offer is back, with a 10% discount on parts and labour, plus FREE local collection and delivery when we service your garden tractor, lawn tractor or ride-on mower. The 10% saving is for full services only, on any machine. And now we are no longer VAT registered there’s no VAT added to your bill, making your overall service even cheaper. Our Winter Service Supersaver is always popular so book now to be sure of your 10% saving. And remember, this offer must end on 1st April 2018 . So what’s included in a WG Gardencare Machinery full lawn tractor, ride-on mower or garden tractor service? The answer is, a thorough and meticulous check on every element of your machine including cleaning, lubricating and tuning. For petrol mowers, for example, we steam clean the machine, strip the carburettor, flush the fuel tank and replace the pull starter cord, fit a new spark plug, replace the air filter, sharpen and balance the blade, check and adjust the drive belt, lubricate the height adjuster and all control levers and cables. Finally, we tighten the engine mounting and handlebar bolts, run and test all machine functions, check the running speed and tune the carburettor. You can find out more about our full service here. As part of your full service we also supply a complimentary fuel stabilizer, which means you don’t have to drain the tank prior to storing your machine for the winter – a practical, time saving touch that’s typical of WG Gardencare Machinery’s service. Why not book your garden tractor or mower in for its full service now before you put it in storage, and be sure it’s running smoothly and ready to go in the spring? Email us now or call us on 01403 700743 and we’ll be happy to help. A ride-on mowers main function is to cut the grass. This type of mower is the smallest kind of garden machine, where the seat towards the front and the engine is at the back. Ride-on mowers have smaller cutting widths, from about 60cm, and engine sizes, from about 4.4kW. They are the least expensive to buy. Generally lawn tractors are larger than ride-on mowers and are the opposite way around with the seat at the back and engine in front. Their cutting widths start at about 76cm and they have more powerful engines, from 8kW upwards making them suitable for larger areas of lawn, tougher terrain and harder tasks. Garden tractors are real heavy-duty machines and have the most powerful engines, 11kW and above, the widest cutting widths and the strongest build. In addition to regular mowing, they can be used for towing, tilling and snow clearing. And for this reason it usually makes garden tractors the most expensive of all. Some of the more expensive mowers have four-wheel drive, also named ‘all-wheel drive’, often with a differential lock. These mowers or tractors are particularly useful for difficult gardens with sloping lawns offering better traction and less wheel slip. Whichever mower you choose, it is important to go for as powerful an engine as you can afford, as this will have the force needed to tackle a slope. Also look out for engines that have pump lubrication to ensure that there is continual lubrication to the engine even when the mower is at an angle. Wheel chains can also help, as can a pivoting rear axle. Most manufacturers give recommendations about the use of garden machines on sloping ground, and limits on the slope on which a machine can be perform normally. For lawns that have a number of obstacles, individual trees, large bushes, water features or ponds, a ‘zero-turn’ model could be the best option. These machines are designed to turn on the spot, so they’re easily negotiate obstacles on the grass. And there’s also no wasted movement when you’re turning at the end of each ‘stripe’, and they’re good for parking in tricky storage areas. The ‘zero-turn’ models have two steering handles that separately control the rear wheels, instead of the conventional steering-wheel system, controlling only the front wheels. They usually have a faster top speed than most conventional models, too. Hydrostatic transmission models are better than manual ones for ease of manoeuvrability and tackling obstacles. Whether you want ride-on mowers or tractors that collect the grass or mulch it, the information below may help you decide which is best for you. Large areas of grass generate a lot of grass clippings, and what you decide to do with them will affect the lawn’s finish and the amount of work needed. There are two options for you to consider, you can collect and dispose of clippings on the compost heap or recycle them back into the lawn. There are a number of mowers or tractors that have a rear collection facility. The cheapest rear-collection mowers rely on airflow to push clippings into a collection bag. However, the more expensive machines use a powered sweeper to brush them up, or have an integrated rear-collection system. If you don’t want to pick up your grass clippings, you can often buy a deflector, which goes on the back or side of the mower and helps distribute the clippings evenly over the lawn. But if considering this option check the size of the collection bag as the larger it is, the less frequently you’ll have to stop to empty it – although it will also be heavier. Some have to be emptied manually, while others have an automatic tipping system to reduce the amount of effort involved. Lawn garden tractors that have mid-mount cutting decks with side ejection give you the option of spreading the clippings from the side of the deck when you don’t want to collect them. This is a good choice if you mow your lawn regularly and have a small amount of grass clippings as in hot conditions it helps to protect the grass from drying out and scorching. As an alternative mulching mowers can give you the best result – the machines blade cuts the clippings until they are very fine, and then blows them on to the lawn. Here overtime they decompose and help feed the grass. You can combine or convert some collecting mowers into mulching mowers by buying a special mulching plate which you can alternate between mulching or collecting depending on the weather conditions and the length of the grass. Is a petrol chainsaw right for me? A petrol chainsaw is a good choice if you have a lot of logs to cut or heavy pruning to tackle in the garden as it will cut through large logs faster than any other machine and you can use it anywhere without the hassle of a trailing power cable. Petrol chainsaws can also be heavy, so it’s worth testing one out before you buy to check whether it’s one you could use comfortably for a reasonable period of time. Consider how you would use a chainsaw for different jobs: pruning branches would involve making single cuts with rests in-between but chopping logs would be a series of vertical cuts in a continual motion. Petrol chainsaws are noisy, some more than others, but all are likely to irritate the neighbours if you use them constantly and they give off powerful petrol fumes. Which petrol chainsaw should I buy? Petrol chainsaws come in different sizes and power capacities depending on the sort of work they’re designed to do, from pruning the branches of a shrub to felling large trunks. Most of the petrol chainsaws you’ll find in DIY stores and garden centres are designed for domestic use and have a guide bar of 40cm or less and are the best choice for cutting jobs around the garden. Howeverer, choosing a chainsaw isn’t just about cutting. You want a machine that’s easy to use, manoeuvre and maintain. How does a petrol chainsaw work? With a petrol chainsaw the engine drives a metal chain, with lots of cutting ‘teeth’, at high speed around an oblong-shaped guide bar. As the spinning chain makes contact with a log or tree trunk, its teeth are dragged along the surface, cutting the wood. The circular motion of the chain keeps the teeth in contact with the wood, so the saw keeps cutting until it has sliced all the way through or the power is stopped. Most petrol chainsaws have two-stroke engines, which are similar to those used in mopeds or outboard boat engines. It’s worth bearing in mind that a petrol chainsaw’s engine will require regular servicing to keep it in good working order. Petrol chainsaws need a specific mix of petrol and engine oil. Most petrol chainsaws run on a 50:1 petrol-to-oil ratio, but check the user manual for the exact ratio your chainsaw needs. Petrol chainsaws also need lubricating oil to ensure the chain runs smoothly and doesn’t snag. Look for a chainsaw with an integrated oil chamber that supplies oil automatically, as this will save you time and hassle. Most petrol chainsaw models come with these as standard, but check before you buy. If you don’t use a petrol chainsaw regularly you must drain it of fuel and oil between uses. If you have any questions, require help choosing a petrol chainsaw or your chainsaw needs servicing then please contact Jeremy or Graham on 01403 700743 or email us and we will be happy to help. Now is the perfect time of year to get that ride-on mower or tractor you’ve always wanted. Here are some things to keep in mind if you are shopping for a new one. 1. Buying the right Ride-On Lawnmower for your garden. Make sure that the mower you purchase is able to drive around trees, bushes or swings in your garden. Also take things like ponds, hills and fences into account. Ride on mowers typically have front wheel drive, rear wheel drive or zero-turn mower handling. 2. Do you have the need for speed? If you have a garden with lots of obsticles, you may need to slow down to achieve the desired cut. If your garden is large and mostly clear, you may want to speed up to get the job done quickly. A multi-speed system gives you the best of both worlds. 3. It’s all in the engine. Engine power is important in buying a new ride on mower, but it’s not the only thing that should be taken into account. Make sure the ride on lawnmower engine has a quality cooling system and an oil filtering system to extend the life of your engine. 5. Consider the maintenance schedule. While regular tune-ups and lawn mower maintenance are critical to your new mower’s health, consider factors that may also help protect your engine and reduce the need for repairs. For instance, dirt and debris can damage an engine. Make sure you thoroughly clean the engine surrounds after each use. If you are looking to purchase a new ride-on tractor or lawnmower then contact us or click here for more information. If you have not already had your ride-on lawnmower or lawn tractor serviced ready for Spring then please give us a call on 01403 700743 to see how we can help. Your lawn still needs work in the winter months when you have stored your lawnmower or Ride-on-Tractor away. If the weather is mild you can lay a new turf or repair hollows and bumps in an existing lawn. For the latter, make a ‘H’ shaped cut in the turf, peel back the grass and either fill the hollow with loam, or scraping away the soil from a bump. Re-lay the turf, press it into place and pinch the cut edges together. Repair lawn edges, especially around flower and shrub beds, with turf cut from other areas of the lawn. If your lawn suffers dieback from treading during the wet, muddy season, then laying stepping-stones through it to allow easy access across it without causing damage is a good idea. As the weather gets wetter watch your lawn for signs of waterlogging. If you missed the opportunity to carry out autumn lawn maintenance, then you can still remedy the situation a bit, by spiking the lawn with a garden fork or mechanical aerator. Then fill the holes with a mixture of sharp sand and loam, brushed in using a stiff broom. In January and February mole activity will increase due to mating and nest (fortress) building. You will need to move the largest molehills and re-firm before overseeding the bare patches in the spring. Worm casts are particularly troublesome at this time of the year so keep brushing them away so that there is not a build up of soil on the turf surface. Snow mould can be a problem in wet weather, particularly on overfed and lush lawns that have been left a bit too long. During wet conditions these small patches of yellowish, dying grass become covered in a white or pinkish, cottony fungal growth. The only fungicide available to buy over the counter is Bayer Garden Lawn Disease Control and can be used all year round except when there is a drought or the ground is frozen or covered with snow. However, use should be kept to twice yearly and combined with other non-chemical control methods. Algae can be a problem on lawns where there is poor drainage, excessive shade, or under the drip-line of trees. And remember if you have not already had your lawn mower serviced ready for Spring then please give us a call on 01403 700743 to see how we can help or click here for more information. What to consider when buying a lawnmower. Whether you are buying a new lawn mower from scratch or upgrading or replacing your existing mower, here are a few tips on what you need to consider before doing so. The most important consideration is the size of your lawn. A small garden would be mowable with either a hand push or electric mower. Medium and larger lawns will probably need a motor but with a large garden the awkwardness, not to mention the danger, of an electric wire trailing behind you could mean a cordless electric or petrol machine would be the best option. If the power cable is not an issue then make sure it is long enough to extend to the end of the garden. Cylinder mowers – These have a rotary blade at the front of the machine which cuts the grass in a scissor motion. Cylinder lawnmowers work best on frequently cut lawns, and struggle more on damp/longer grass or uneven surfaces. However, they can be the most expensive. Hover mowers – These can be effective on uneven surfaces, on smaller or sometimes medium sized gardens as well as irregularly shaped lawns. You can get hover mowers that either collect the grass or just redistribute the clippings on the lawn for you to rake later and they are usually cheaper than electric cylinder and rotary mowers. Heavier machines can, however, make your arms ache if you have a large lawn. Rotary lawnmowers – These have a blade that rotates underneath the mower. The machine is on wheels and often has a rear roller, giving the ‘stripe effect’ seen on many football pitches. A rotary mower with a roller is also useful because you can go to the edge of the lawn, cutting the edges. How a lawnmower is powered will make a difference to its portability and how much effort it takes to use it. A hand push mower will mean you are doing a lot of the work. A corded electric mower will be less effort if you have a medium sized lawn, whilst a cordless electric lawnmower means that you don’t have to worry about how far the cable will reach. Petrol mowers are the most powerful but can be heavy. And cordless lawnmower can be £200 – £300 more expensive than corded models and electric mowers are cheaper to run than petrol. When it comes to the grass, a lawnmower that collects the grass clippings saves the hard work and time of using a rake. If you have a medium or large lawn mowers with a collection bag/box is a good investment or one which mulches. It chops up the cuttings, pushing them into the turf, where they decompose and feed the soil. With mulching you are putting the nutrients back into the grass and over the course of the season the quality of your lawn will improve. You can get a mulch facility on a mower, or some allow you to add a mulching plug; check this before you consider buying your machine. Mulching works most effectively after the grass has been cut a few times at the beginning of the season. For further advice or help choosing a lawn mower that is suitable for your needs please contact us or call 01403 700743 and Graham or Jeremy will be happy to help. These are a ride-on mower, lawn tractor or garden tractor, however, there are further options if you have a lawn this is difficult to mow. A ride-on mowers main function is to cut grass. This type of lawn tractor is the smallest type of machine with the engine at the back and a seat towards the front. They have smaller cutting widths (from about 60cm) and engine sizes (from about 4.4kW) and are the cheapest type to buy. Generally, lawn tractors are much larger than ride-on mowers and have the engine in front and the seat behind. Cutting widths start at about 76cm. With more powerful engines, from 8kW upwards, this makes them suitable for larger areas, tougher terrain and harder tasks, such as towing (although they are limited to fairly low towing weights). Garden tractors are the real heavy duty machines with the most powerful engines (11kW and above), the widest cutting widths and the toughest build. Not only can garden tractors do all the regular mowing, they can also be used for towing, tilling and snow clearing. With all these extra features they are, unsurprisingly, the most expensive of the three types of lawn tractor. Some of the more expensive tractor mowers offer four-wheel drive (sometimes called ‘all-wheel drive’), often with a differential lock. These are particularly useful for difficult ground, such as those that slope, as they offer better traction and less wheel slip. Whichever mower you choose, go for as powerful an engine as you can afford, because then the mower will have the force needed to tackle a slope. Also look out for engines that have pump lubrication to ensure that the engine is lubricated even when the mower is at an angle. Wheel chains can also help, as can a pivoting rear axle. Manufacturers have recommendations about the use of machines on sloping ground and limits of the slope on which an engine can be expected to perform normally. If you have a garden with plenty of interest including areas with small turns and hidden spaces consider a ‘zero-turn’ model. These are designed to turn on the spot, so they’re easy to negotiate around obstacles. There’s also no wasted movement when you’re turning at the end of each ‘stripe’ and they’re good for parking in tricky storage areas. They have two steering handles that separately control the rear wheels, unlike the conventional steering wheel system which only controls the front wheels. These mowers generally have a faster top speed than conventional models, too. If you need any help or advice on which ride-on mower, lawn or tractor mower to choose then please contact us or give us a call on 01403 700743 and our trained and experienced team will be happy to help. We also offer a wide selection of garden tractors and ride-on mowers which can delivered direct to you.